If you’re like me, you want the best for your kids – good marks at school, lots of friends, excellence at sports and team events. You also know how frustrating it can be to see your child holding back from doing their best, not because they can’t do something, but because they lack confidence and self-esteem. Doctors and psychologists say that high self-esteem is one of the most important character traits for children to have in order to succeed. As an instructor for over twenty five years, I see kids who lack confidence get lower grades in school, get picked on far more by bullies, have fewer friends and succumb more easily to peer pressure. And for a teenager these pressures can be almost constant, given the continuous interaction of social media in everyone’s lives. You may be thinking, “What has this got to do with karate?” My name is Scott Bullard and I am a sensei (chief instructor). I teach a highly successful program designed to help teens to lead healthy lives physically and emotionally and reduce negative stress. It is called the Teen Karate & Kickboxing Program taught at Canada’s Best™ Karate. Before I explain the details about the Teen Karate & Kickboxing Program, lets first identify where your teen may need help in order to succeed in life. See if our classes are right for your teen with our 10-Day All-Access Pass! What skills does your teen need for success? How do you know if your teen has learned the kind of life skills that will bring them personal success and happiness? Take a moment and look at them with honest eyes. What do you see? The confidence to make new friends? The concentration to excel at school? The courage to meet new challenges? The awareness and strength to avoid drugs? The self-esteem to believe in themselves? The students at Canada’s Best™ Karate are learning these skills and attitudes because our programs go beyond teaching students blocks, kicks, and strikes. Our programs teach life skills – the mental and emotional tools that enable your child to achieve their highest goal: becoming the best person they can be! Last year my daughter, Lori, won a free trial membership at Canada’s Best Karate. We took advantage of this and decided karate was something for our family. We did not realize the extent of the benefits that would follow. My son, Stephen, who has also joined Canada’s Best, was lacking in confidence and receiving adequate grades in school. He is now more confident and his grades have improved. Lori, who was confident and did well in school has had this reaffirmed. Not only have the children realized physical benefits from karate, but they have found something that’s part of them. Like running is my own personal lifeline, so too has karate become the family’s lifeline. We are all happier and more confident. Certainly going to a school that is surrounded by the love for karate, it has been easy to make it part of our lives and our hearts. I’m really glad we joined. Although our techniques are based on centuries old knowledge, our application of that knowledge sets Canada’s Best™ Karate schools apart from the other schools. From the moment you walk into our facility, you can see that we place a lot of emphasis on safety: the training area is covered wall-to-wall with a K2000 safety floor and we use a large supply of padded training equipment so that our students do not have to fear being kicked or punched in class. Canada’s Best™ Teen Karate & Kickboxing Program provides the structured discipline of traditional karate instruction with modern training methods to smoothly meld the past with the present. Your teen will enjoy a wide variety of class styles, which means never having to worry about being bored. From intense combinations to dynamic pad and shield drills to realistic self-defense scenarios that simulate an attack, they will get to train in an ever-changing environment without having to change schools! Managing the Stress of today's world! How does Canada’s Best™ Karate teach skills and attitudes for success? It’s well documented that martial arts training instills mental focus and self-discipline. Stories abound of underachieving students and ‘problem’ kids being transformed, producing good marks and excellent behaviour. Canada’s Best™ Karate gives your teen this vital boost in life. How do we do this? 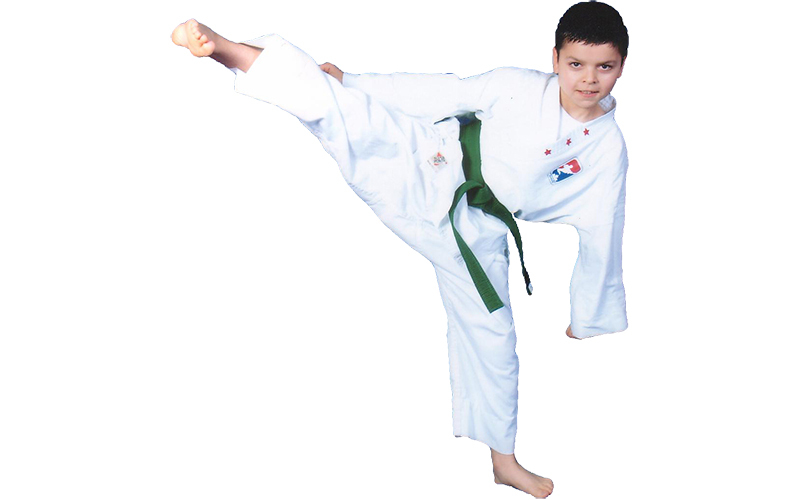 Canada’s Best™ Karate takes the discipline of the Martial Arts and make it fun AND challenging! There is never a time where our students are told they can’t do something – through repeated encouragement and reinforcement your teen will come to realize they can accomplish any goal, both in and out of our karate school. Along with traditional physical training in karate, our students study and practice the different mental skills and positive traits that lead to a life of success. The result is a complete learning experience that balances body, mind and emotion, enabling your teen to grow as a WHOLE PERSON. Enrolling your teen in a martial arts school may feel like a big step. I certainly understand the complicated choices parents face in selecting activities and schools for their children. If you are ready to consider a martial arts program for your teen, let me make your choice as easy as possible. Try the Canada’s Best Karate 10-Day All-Access Pass – click here! Your teen can try out our amazing confidence-building program by registering for our 10-Day All-Access Pass. For only $19 + HST you can attend unlimited beginner classes for 10 days, plus for limited time we will include a FREE CBK Karate Uniform – a total discount of 80% off!